Bestfly, an Angola-based aviation services company, enters the rotary market with the addition of two Leonardo AW139 helicopters to its Luanda-based fleet in partnership with Héli-Union. The partnership is operating the machines for an undisclosed leading energy supplier with numerous on- and off-shore locations in Angola. 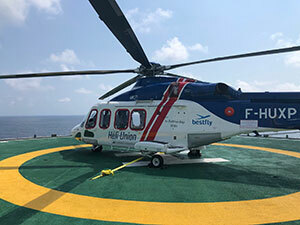 The helicopters will be used predominantly for medevac purposes, in addition to performing crew changes from the company’s oil rigs, and will also be available for charter. Héli-Union has been in discussion with Bestfly since May and spent significant time auditing the operator’s fixed-wing operations before selecting the business for its local rotary operations. Bestfly is partnering with helicopter operator Héli-Union to support the new operational requirements and enable the immediate start of flights. The helicopters are the first rotary equipment the ISBAO operator has added to its fleet since launching in November 2009. The machines are currently registered on the French company’s AOC but will move to Bestfly’s Angolan AOC and be registered in Angola within six months. The first helicopter is already on site at the Bestfly facility and made its inaugural flight on November 23, 2018. The second machine will be in-situ and operational by the end of the year. All operations will reflect the safety and quality standards that both companies implement at their international bases. “We’ve worked hard to achieve international safety and OGP standards, and the decision to place these two machines with us reflects the confidence the owner has in our operations. This is a great opportunity for Bestfly to expand its service offering for our local customers and add more capabilities to the business. We hope to add more helicopters to the fleet over the next twelve months as demand for the operational flexibility delivered by these machines continues to expand here,” says Nuno Pereira, CEO of Bestfly. The AW139 aircraft are also now available for third-party charter, and Pereira anticipates they will be welcomed by the developing mining, agriculture and telecom sectors where destinations regularly require operations in and out of areas with either minimal or no airport access or services. Héli-Union will also use its extensive experience to support Bestfly with maintenance and pilot training. “We’ve made significant operational changes as we’ve adapted to the requirements of rotary operations. Héli-Union are training up our team in all aspects of ground handling, operations, protocol, dispatch and maintenance. The addition of the helicopters isn’t just important for our business but for Angolan aviation in general, as we plan to build a fully Angolan-led rotary team and crew within a few years. This will add valuable skills to our local and regional aviation community,” adds Pereira. “We are proud to partner with Bestfly in Angola in the frame of Héli-Union expansion. Thanks to our significant experience on building win-win partnerships, Héli-Union will remain fully involved in the operations to ensure Bestfly success,” says Jonathan Cosson, deputy CEO, Héli-Union.